Americaine Hemorrhoidal Ointment is an anti hemorrhoid ointment that is meant to temporarily relieve some of the symptoms that are often associated with hemorrhoids. According to WebMD, use of both of these ingredients is recommended only after consultation with a physician. Taking the Americaine Hemorrhoidal Ointment is simply the application of the ointment. It is recommended to clean the area first with a soft soap and warm water. After patting dry, applying the ointment is all that is needed, up to 6 times a day. 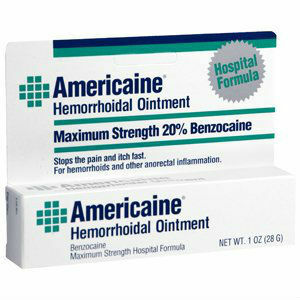 Children that are younger than 12 should consult a doctor before using Americaine Hemorrhoidal Ointment. Our research did not uncover any side effects from using the Americaine Hemorrhoidal Ointment, however this is more due to lack of proper documentation than lack of side effects. During our research on the Americaine Hemorrhoidal Ointment, we were unable to find a price listed for the item regulated by the manufacturing company. One tube of Americaine Hemorrhoidal Ointment contains 1 ounce of the ointment. There is no guarantee offered with your purchase of the Americaine Hemorrhoidal Ointment, meaning that if the product were to be ineffective for you, you will be unable to obtain a refund. The Americaine Hemorrhoidal Ointment is a possibility for temporary relief, however, it does not contain ingredients that are inclinitive of having any beneficial properties for the treatment of hemorrhoids. John Parker	reviewed Americaine Hemorrhoidal Ointment	on October 22nd	 and gave it a rating of 2.